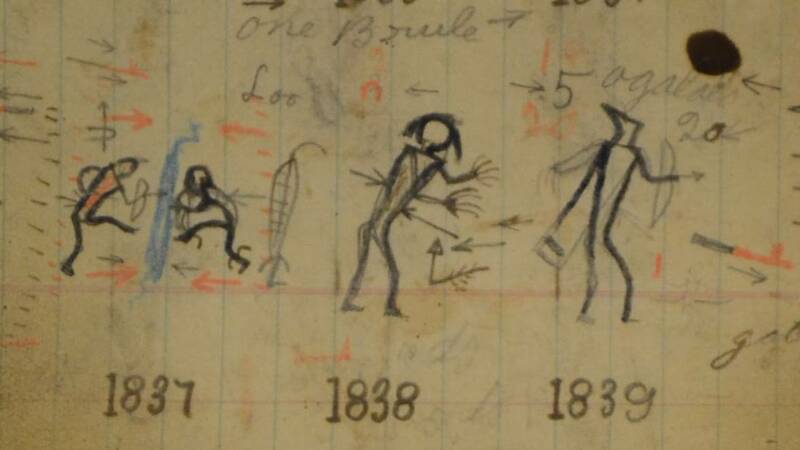 Winter counts are pictorial depictions of Lakota history. Prior to the adoption of a written language, Lakotas used winter counts as a means of recording important historical events. Individual tiospayes, or bands, created and maintained their own winter counts. Within each tiospaye a single individual, known as the winter count keeper, was charged with recording and interpreting the winter count. Each year in the history of a tiospaye is depicted by a single picture, or glyph. These glyphs record the most important annual event for the tiospaye, and the selection process was made communally; it was not the sole decision of the winter count keeper. Once the event had been selected, it was the responsibility of the winter count keeper to create the appropriate glyph and add it to the winter count. 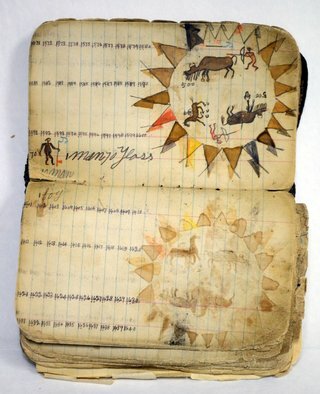 Historically, winter counts were painted on bison hides. 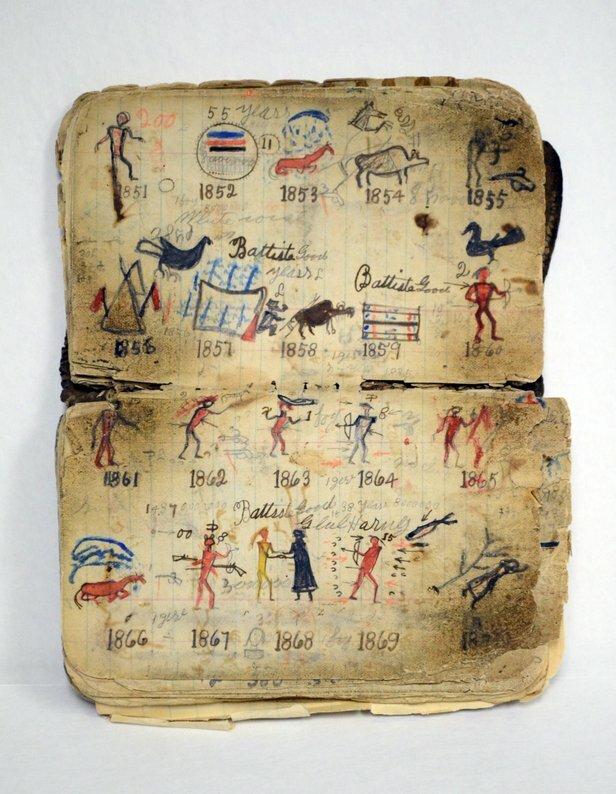 Following the near extinction of the bison in late 1800s, Lakota artists began to use paper from old ledger books as a substitute painting surface for their winter counts. 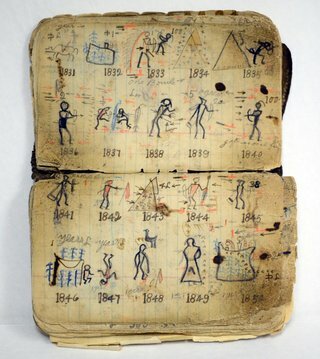 Just as ledger art was the successor to the painted hides of the pre-reservation era, winter counts on paper and ledger books replaced the tradition of those painted on hides. The winter count shown here is part of the collection of the Sioux Indian Museum, U.S. Department of the Interior, Indian Arts and Crafts Board. It was created by Battiste Good (Sicangu Lakota). Born ca. 1821, Good was the leader of the Tiglabu tiospaye within the Sicangu tribe. He was present at the negotiations of the 1868 Ft Laramie Treaty. In 1878, he settled on the Rosebud reservation with his tiospaye. Battiste Good’s son, High Hawk, would inherit his father’s responsibility as a winter count keeper. Following Battiste Good’s death in 1894, High Hawk maintained his own winter count, which he continued through 1912. 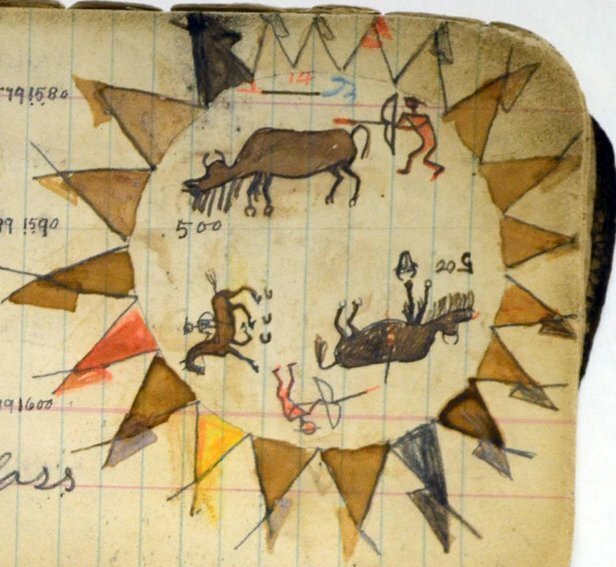 Battiste Good’s winter count contains over 500 years of Lakota history, going back to the era before the horse. This makes it relatively unique among known winter counts. According to noted ethnologist Garrick Mallery: “this count formerly embraced about the same number of years as the others, but that Battiste Good gathered the names of many years from the old people and placed them in chronological order as far back as he was able to learn them” is significant. 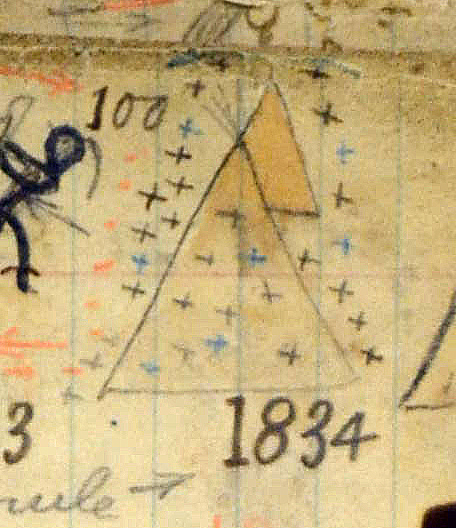 Two glyphs in Good’s winter count are particularly interesting, and they depict events in the years 1834 and 1868, respectively. In the context of winter counts, the year 1834 is important and is often referred to as “the year the stars fell.” The Leonid meteor shower was extremely intense in November 1833. Virtually every known winter count recorded this event. Battiste Good depicted this event with a glyph that shows a tipi covered in, and surrounded by, stars. The year 1868 is significant because the Treaty of Fort Laramie was signed in the Wyoming Territory. This event is also recorded on numerous Lakota winter counts. 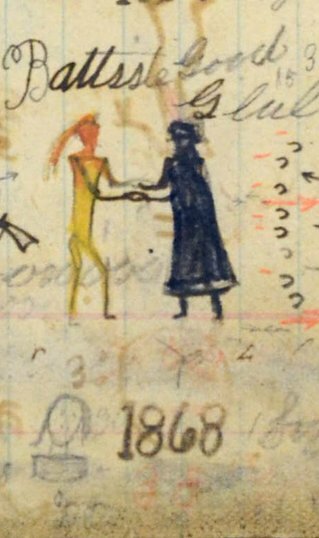 Battiste Good’s depiction of the events portray him shaking hands with General Harney, one of the architects of the Treaty of Fort Laramie. Winter counts such as this one serve as an important historical record for Lakotas as well as a link between contemporary Lakota communities and those of the past.